Spring is on its way! Are your kids excited? 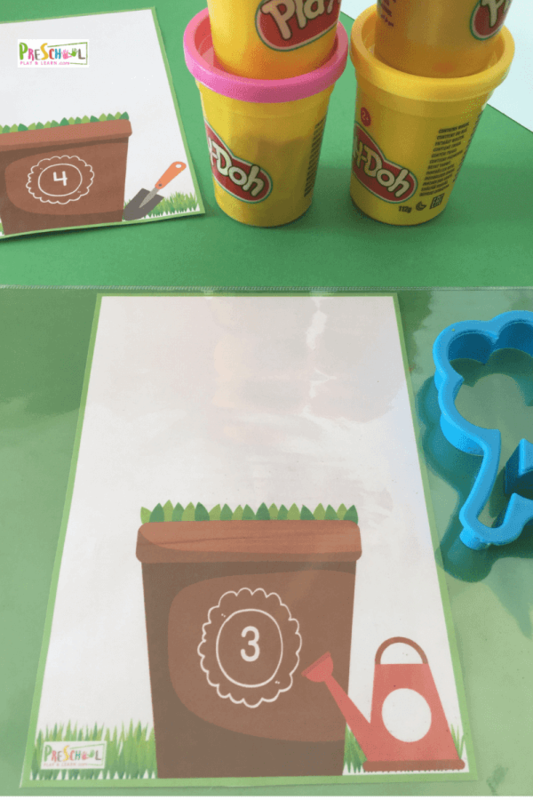 This Counting to 10 Flower Playdough Mats provides a fun, hands on math activities for preschoolers – perfect for Spring-time learning! 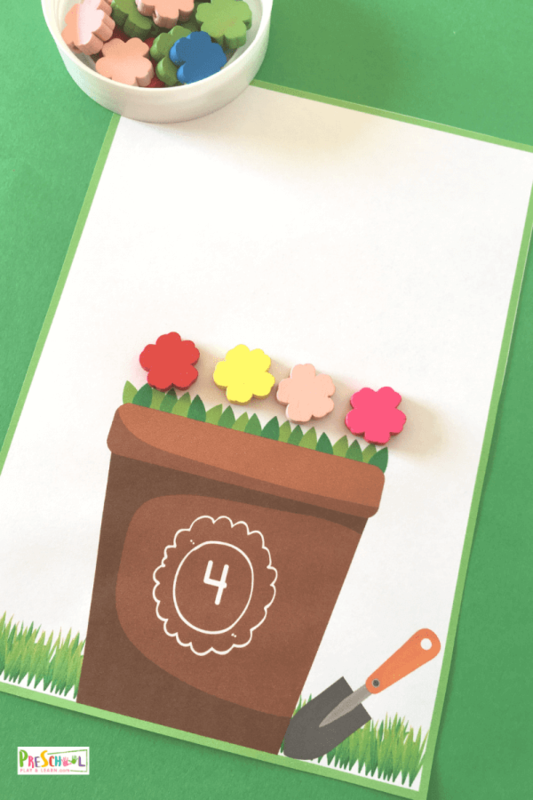 Count away with these flower pot counting mats/cards, perfect for preschoolers! See what number is on the pot and add that number of flowers! Laminate the cards if you wish to make it reusable(or use a dry-erase pocket). 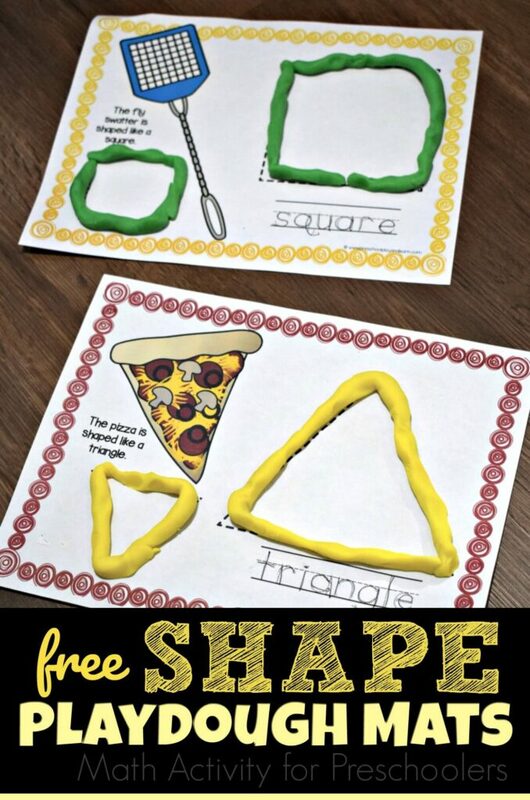 Cut the 10 cards and provide either playdough (you’ll lover our amazing Kool Aid Playdough recipe) with flower cookie cutters, flower beads/buttons/mini erasers or dry-erase markers. 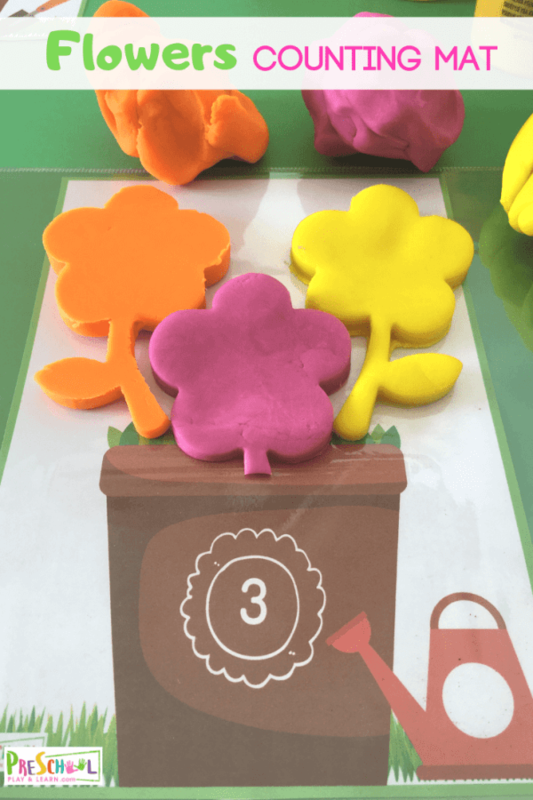 My initial idea was to use the counting mats with playdough, but our flower cookie cutters are big, so only 3 flowers would fit. 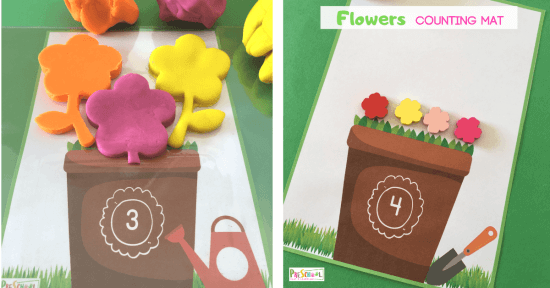 If you have smaller flower cutters , you can use these flower playdough mats for all numbers 1-10. 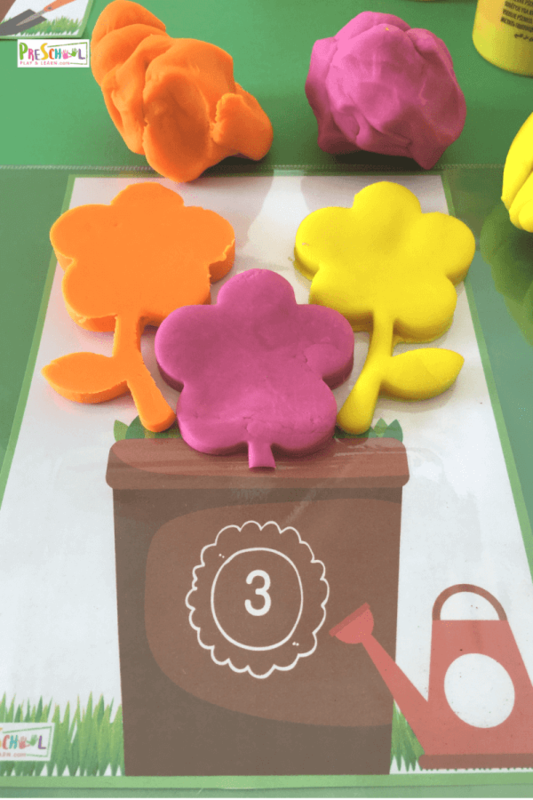 Or young learner can simply roll smaller balls of playdough to make their own flowers in the pot.Playdough provides that extra sensory element to the learning process and also help strengthen little hands so they are ready for writing in the upcoming years. Then, small flower counters can also be used, for instance beads(we used small wooden flowers here), buttons or flower mini erasers. If you can get your hands on candy flowers, it would be perfect too! Just keep in mind that small objects like these can end up in mouths etc. and all over the floor. Supervision is required. 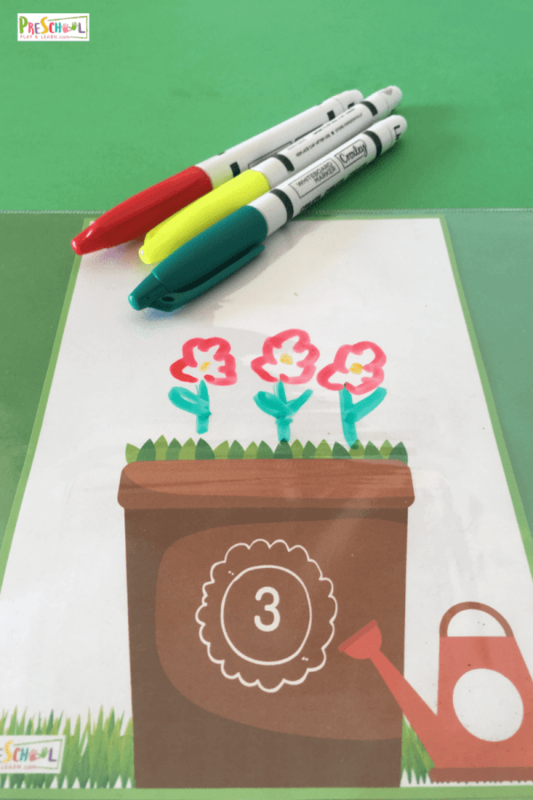 As if that wasn’t enough, you can also count to 10 flowers by drawing them in the flower pots with dry erase markers. This is a good alternative and a group of kids can easily use these mats independently in your Math center, wipe clean, and repeat. 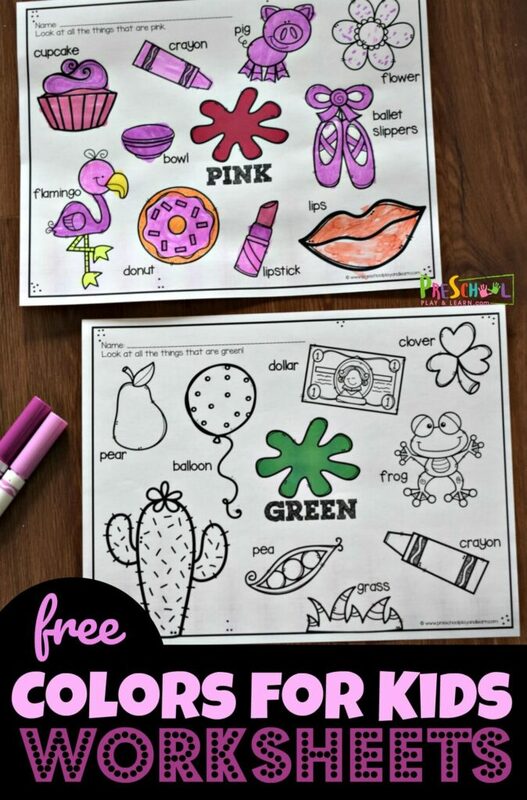 This can also be used at home as a quiet time activity or while on the road as a busy bag activity. 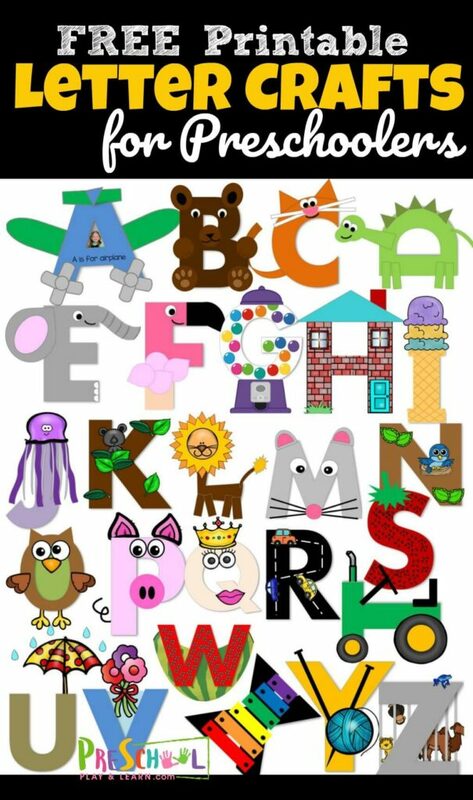 Such a fun counting activity for preschoolers AND perfect for your Spring theme/unit! Have fun counting flowers!